Salzburg Online is a moderated social platform orientated around identity and connecting an international network of critical thinkers. The platform, created as an alumni network for the Salzburg Academy on Media and Global Change, encourages the continued engagement of past, present and future fellows through regular group discussions. This solves the issue of a disconnected community by essentially extrapolating the three-week immersive seminar onto an online platform with indefinite possibilities to engage, collaborate, inform, create and incite civic change. This would be a closed social network for Academy participants. It also replicates the Academy’s current model by allowing past visiting scholars to share their ideas and research. This network of media specialists will come together through discussion boards to reimagine journalism. Unlike traditional media approaches, our platform is shaped by the user, from the profiles to the trending hashtags that highlight shared connections and small discussion boards that can then be put forward for a larger group dialogue on a certain topic of interest. This gives members the opportunity to source stories, workshop ideas, and host internal focus groups to inspire their next project. This collaborative seminar will then be documented in a public newsletter to share potential solutions and approaches to the issues discussed. Salzburg Online’s model allows community members to self-police and actively moderate content and activity. It gives fellows a sense of continued purpose and collective responsibility to maintain the platform’s integrity. Social media is plagued by a lack of self-moderation and limited admin-moderation, which makes platforms both useful for civic engagement, while also undesirable for academic debate. We wanted to form an online community that is solely user-moderated to prove that self-moderation can exist and be successful in an online sphere. Based on conversations during the 12th Salzburg Academy on Media and Global Change (“SAC 12”), there is a great need for social media networks that eliminate biased algorithms and “trolling” among users. With self-moderation as one of our founding principles, our network of esteemed media professionals will have an understanding of the need for journalistic integrity, respect, and professionalism. The SAC connects scholars and students for three weeks in an intensive, immersive environment, but does nothing further to continue the connection after the seminar has ended. 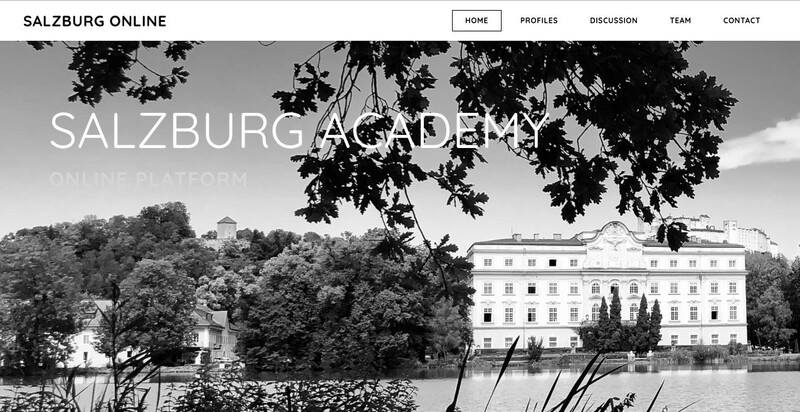 Salzburg Online maintains the momentum of the academy, giving fellows the opportunity to connect and engage on a platform dedicated to fostering that purpose. On our website, fellows are be able to workshop their ideas, receive contributions and ideas from other fellows, and participate in discussions to improve as journalists, so they can affect change outside of the network. This network serves as a safe, supportive space for members to hone their professional skills and passionately engage in their work. The trust in media in many countries is at an all-time-low, so the goal is to empower members to go out in their communities and express how journalists are trying to change the way they do things to adjust to societal and cultural changes.